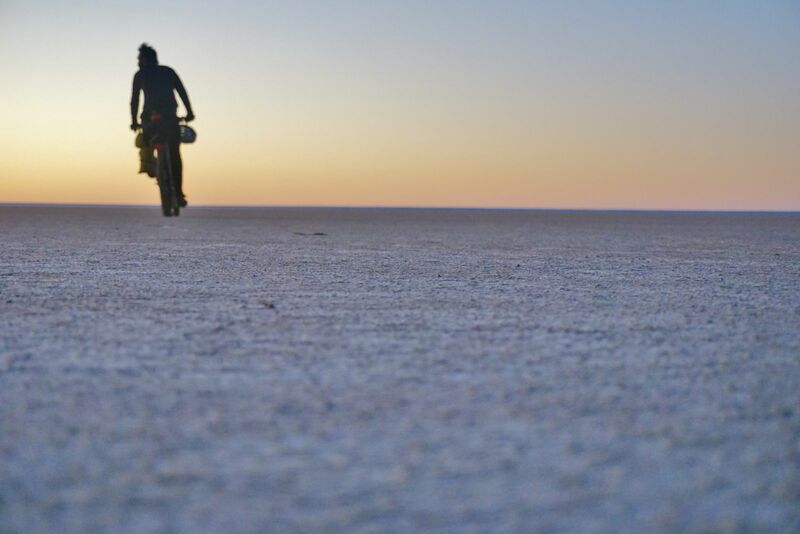 The opportunity to ride the edge of the worlds largest salt lake was too irresistible an opportunity to pass up. 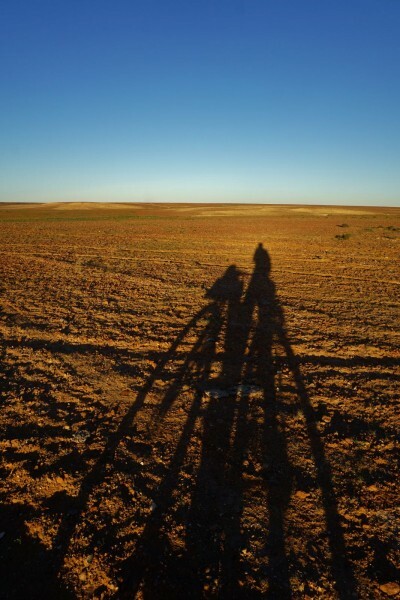 It was in the back of my mind all the way to Oodnadatta. Could I do it? How would I feel as I reached the turn off to the lake? There was always the possibility that I would reach the crux of this great adventure and realize I was too spent and too low on supplies to realize the dream. 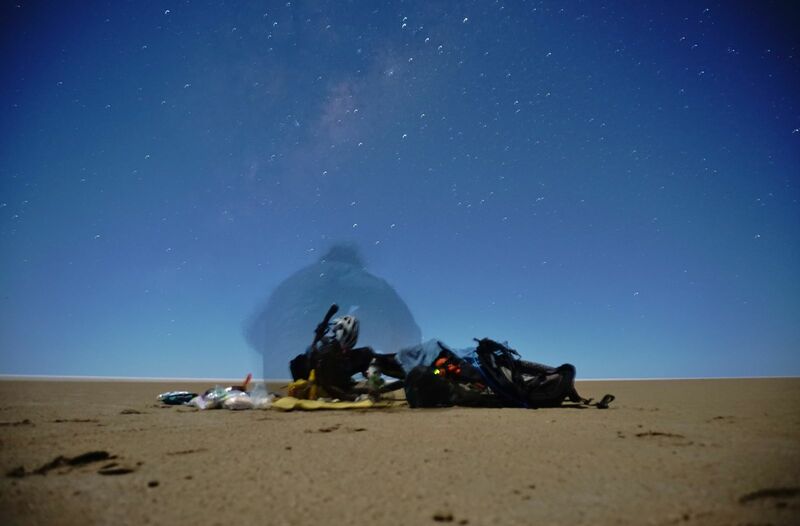 To be honest this is exactly how I felt as I struggled the last 7 km into William Creek, the closest town to Lake Eyre. 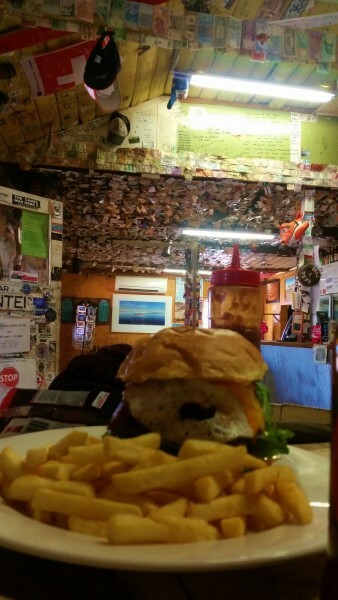 I sat in the Pub for a few long hours consuming all I could, including their fantastic William creek Burger. The William Creek Burger didn’t stand a chance! 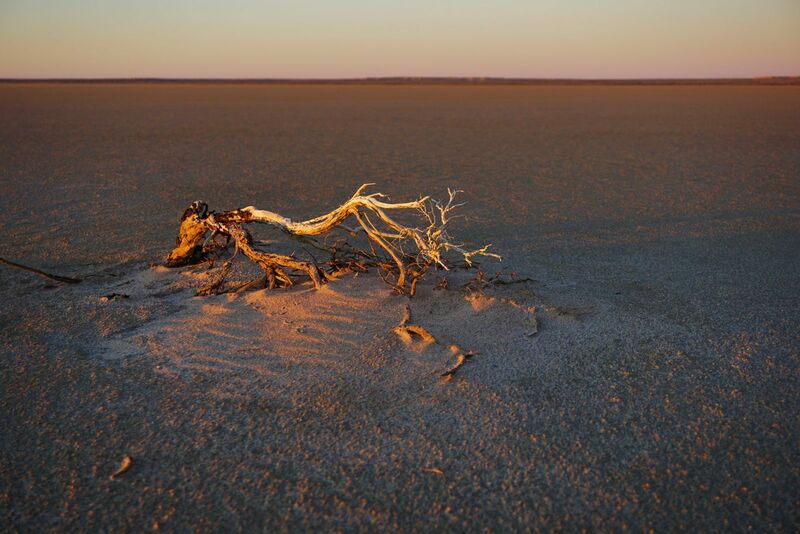 I had told myself during the planning process that Lake Eyre would be a bonus if everything was going to plan. As it turned out things were kinda going to plan. Other than the fact I was a day behind schedule and feeling somewhat shattered the lake seemed an achievable mission as I sank two Coopers Sparkling beers and psyched myself up for what would be 24 hours of unknown consequence! 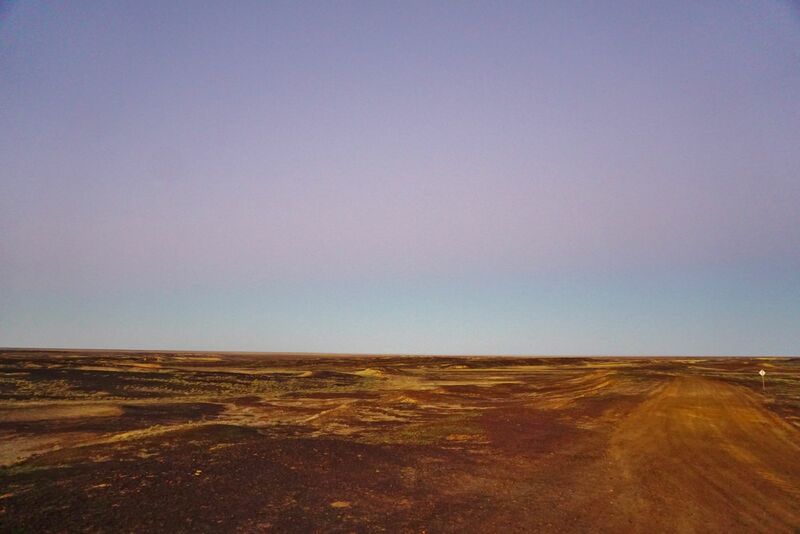 The road out to Lake Eyre turns off 5 kilometers south east of William Creek and extends some 50km to the lakes edge. The rolling mounds of ancient bedrock and dune continued for hours with no sign of the lake, every small crest I eagerly anticipated seeing the lake. 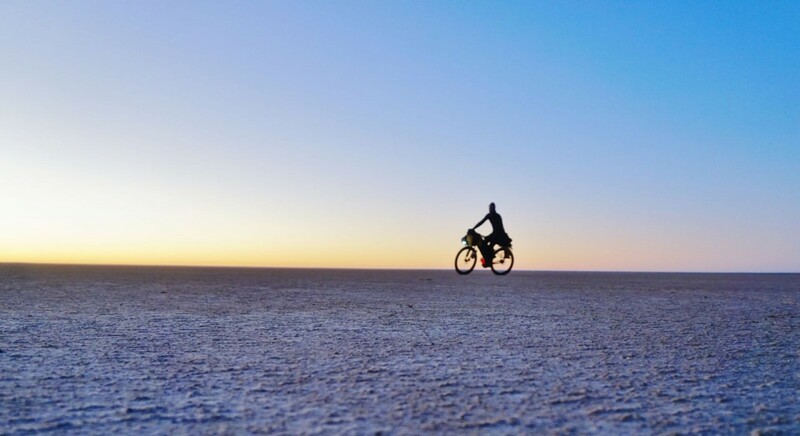 Twelve kilometers out I still had not seen the lake and was feeling deflated that I might not see it before sunset. 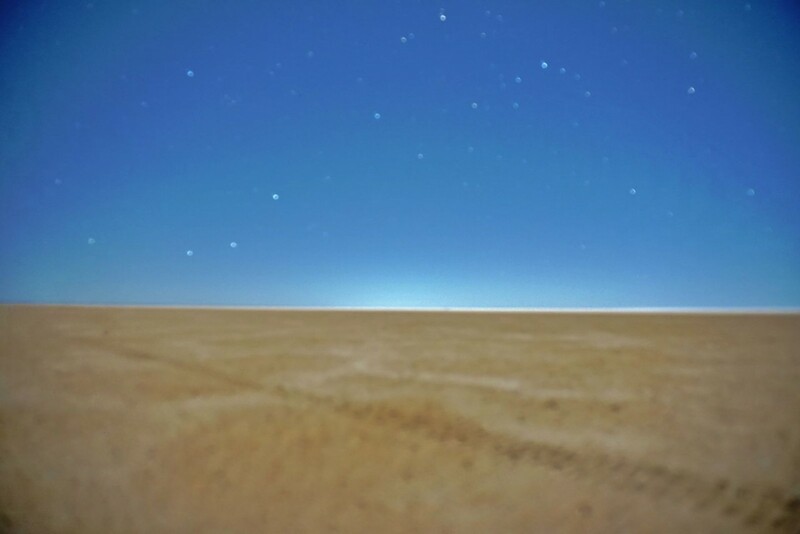 The washboard stretched out for miles but there was still no sign of the lake. Here upon this hill I finally glimpsed the lake from a far. The subtle contours of the hillocks around the lake can only be interpreted from the colorations in the earth. 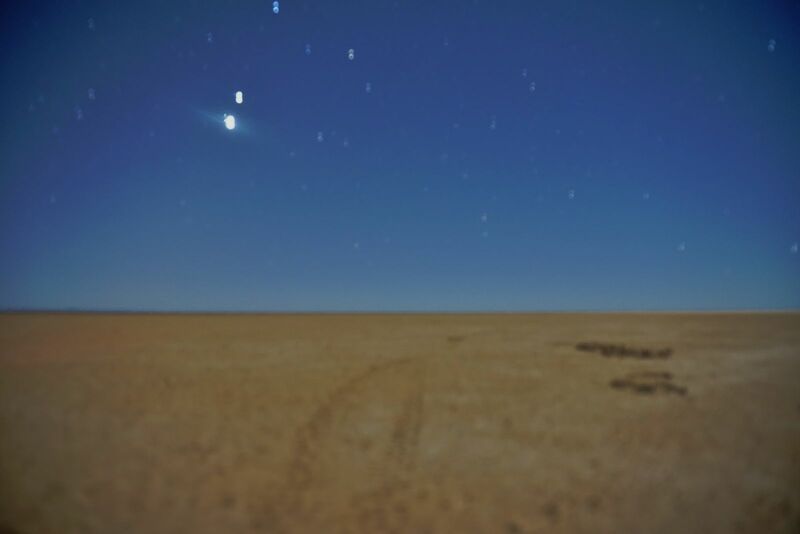 The small road sign in the right of the photo was the only indication that I was in fact on planet earth. I stood atop this small mound and soaked in the grand scale of the landscape before me. As the Sun set and the stars began to shine I made may way out onto the lake. I dropped a pin on the GPS and started tracking towards it. The terrain that surrounds the lake is made up of ancient gibber pebbles washed into small valleys by millenia of floods, it was hard going but the big tyres yet again were in their element. By the time I was on the lake proper the sun was beyond the horizon but still shining into the night sky. Jupiter and Venus were tracking close behind and I was in for a night spectacle like none other I had seen. Along the edges the salt crust was firm and speed could be maintained quite easily. 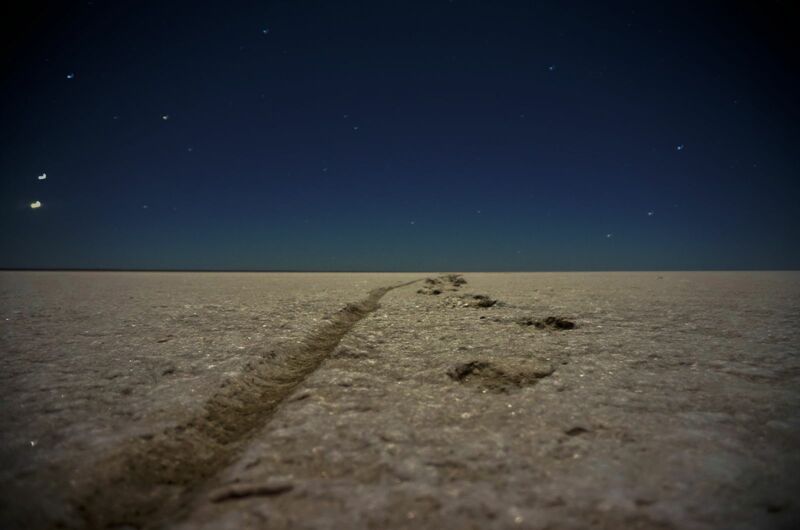 As I ventured further out onto the lake I found myself sinking into the ground more until a point where I broke through the salt crust and very quickly came to a halt as my tyres filled with mud. 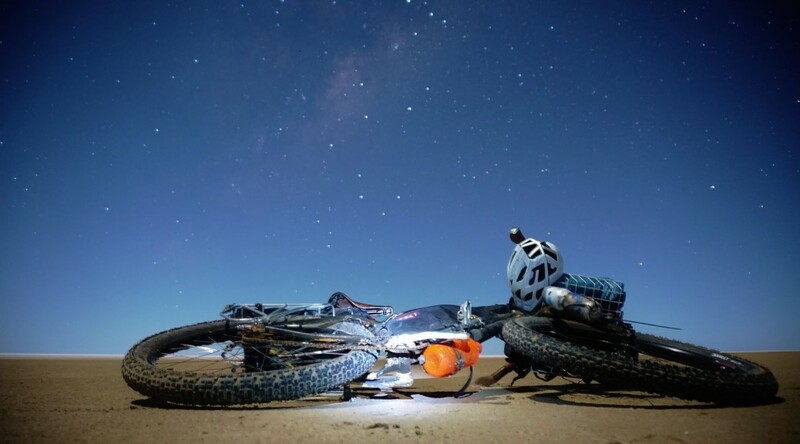 It must have been close to 9pm and by far the longest day I had done on the bike thus far. Soon I realized that I had carried momentum across the thin salt crust for a few kilometers and would have to push back out to where it was firm again. 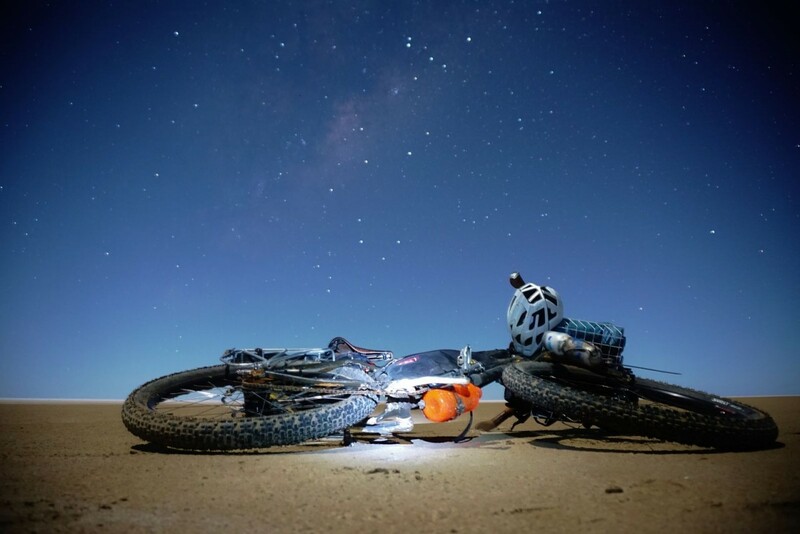 Arduous is one word that could describe pushing a heavily laden bike across a boggy salt flat, however I took the time to appreciate the surroundings and the big night sky which lead me to replace arduous with breathtaking! Words do little to describe some moments in ones life when you push yourself to your limits. This becomes even more apparent when the end destination you pushed yourself to is the worlds largest salt lake on the edge of one of the worlds largest deserts. I slept little that night overwhelmed by my surrounding and just how far off the map I had come. I got packing up around 40 minutes before dawn so I had a good chance to play on the lake as the sun rose. I was also a little concerned as to how long it would take to traverse the lake and station tracks back out to the Oodnadatta Track. Ol mate ten second timer was again doing a brilliant job as my camerman! 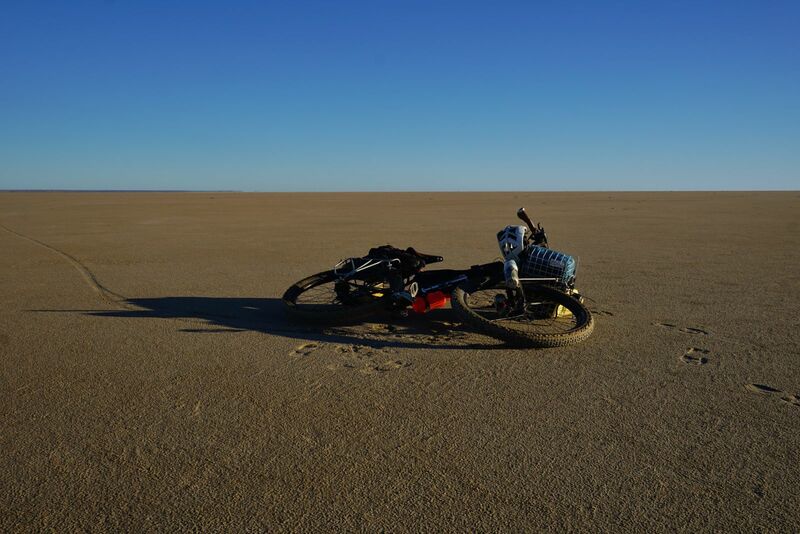 I managed around 12-15 km/h traversing across the south western corner of Lake Eyre. Occasionally there were signs that this great basin does in fact fill with water. Big channels in the sand and the drift wood of desert trees were a reminder that this place is always in a constant state of flux. I was extremely overwhelmed by my position on a world map the entire time I was on the lake and therefore skipped a proper breakfast until I reached the shore. Somehow this sat better with me psychologically to get off the lake as soon as possible to feel a sense of progress. A few hours of pedaling and I had reached my security blanket. It was fun navigating off a heading on the GPS and reminded me a lot of the days I’ve spend in a kayak navigating towards an end point beyond the horizon. The Surly ECR was really beginning to feel like a land yacht! I paused briefly for some breakfast when reached the safety of land. 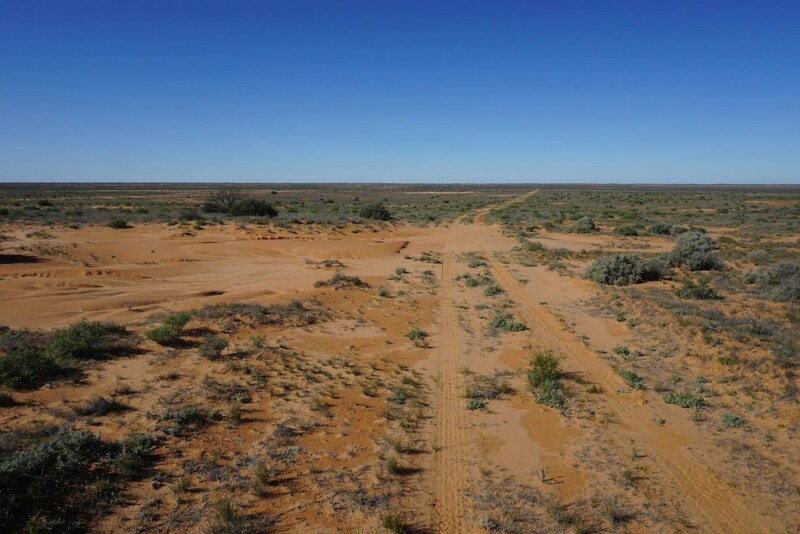 As i set off up the track I startled two dingoes, at first I was a little scared but then I was riding at them at such speed I realized it was they who were frightened and gave chase just to stir them a little. I had successfully navigated myself off the lake to the track that would lead me back out the the Oodnadatta road and the comfort of Coward Springs. 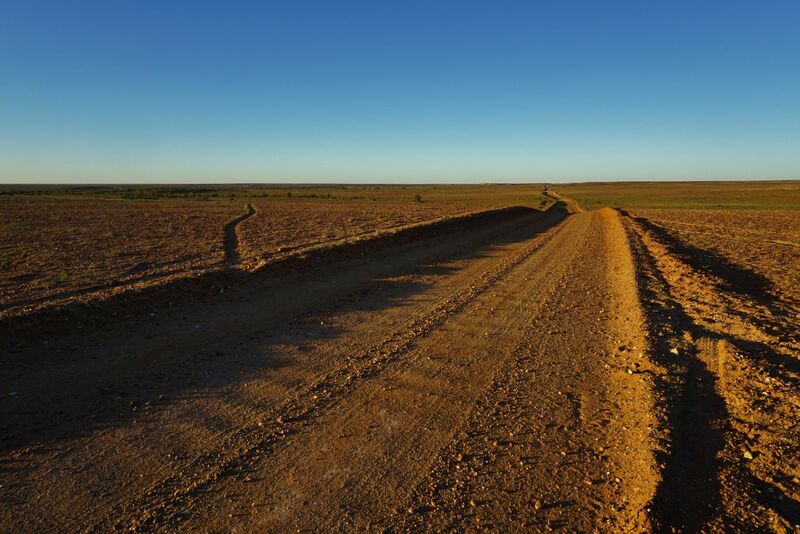 Turns out the track I had cross referenced from various sources was little more than a cattle track following a fence line for 60 km’s! This was by far the toughest bit of riding of the entire trip. However the rewards of riding a bike that is made for this kind of terrain far out weighed the difficulty! 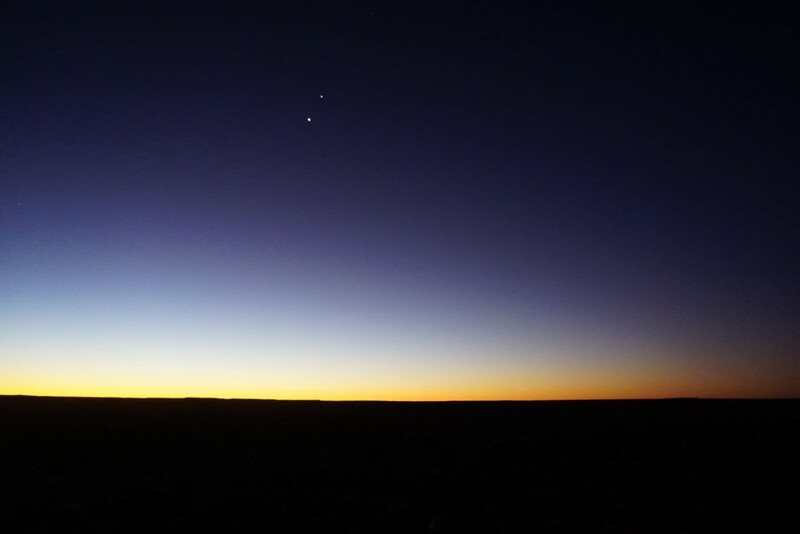 For those of you tackling the Oodnadatta track there is an oasis in the desert! Coward Springs is a mound spring that feeds out of the great artesian basin at a comfortable 28 degrees. 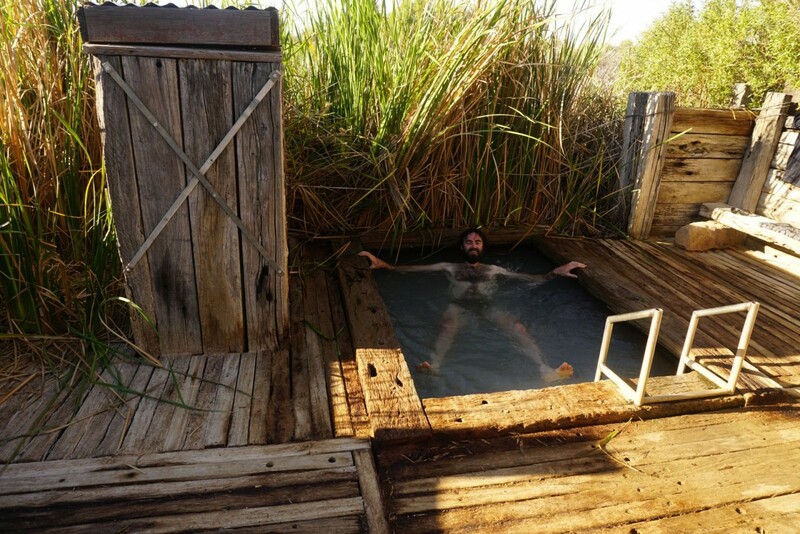 The fine folk who own the station have created a spa bath from sleepers of the old railway line. Its even got jets that helped relive my aching muscles!